LAREDO, TX (April 27, 2018) - Dalia Martinez, IBC Bank executive vice president, testified at a hearing today in Washington, D.C. before the House Subcommittee on Financial Institutions and Consumer Credit regarding FinCEN's Customer Due Diligence Rule. 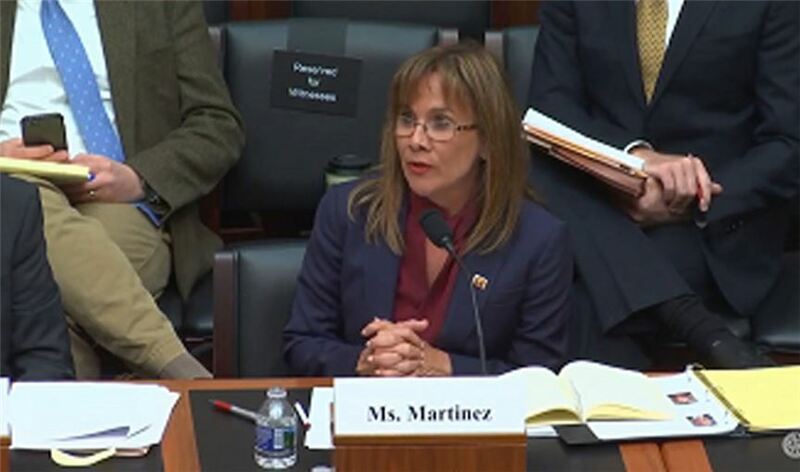 Martinez was at the House of Representatives on behalf of the Mid-Size Bank Coalition of America to voice the concerns of community banks in the United States, who represent, service and support millions of customers. "Every hour a bank employee spends on regulatory compliance is an hour that the employee is not able to spend on what we value most - helping our customers achieve financial success," Martinez said. Martinez has held the position of BSA officer at IBC Bank for more than 27 years. This experience has given her a front-row seat for the unintended consequences of regulation on community banks. "I hope I have conveyed to you that regulatory costs and burdens imposed on banks affect our nation's small businesses," Martinez testified. Community banks across the country struggle with many gray areas of the Customer Due Diligence Rule that are difficult to implement, resulting in accounts being turned away, or causing delays in opening accounts. The rule also puts a burden on banks to ensure the information the customer provides to open an account is accurate without giving banks the tools or guidance they need to determine accuracy of information. "In the 5 years and 4 months I have had the privilege and honor to sit on this committee, we have received testimony from an incredible number of interested stakeholders ranging from consumers seeking to protect consumers to those who are regulated," said Rep. Denny Heck (D-Wash.) a member of the Financial Services Committee and U.S. Congressman who represents Washington's 10th District. "In all that time, Ms. Martinez, I don't think I have ever heard a testimony presented as strong and clear and supported as yours. You are a credit to your profession and I just wanted to thank you for that." IBC Bank and Commerce Bank are divisions of International Bancshares Corporation (NASDAQ: IBOC), a $12.2 billion multi-bank financial holding company headquartered in Laredo, Texas, with 192 facilities and more than 294 ATMs serving 88 communities in Texas and Oklahoma. In 2016, IBC celebrated its 50th anniversary since opening its doors for business in 1966. IBC Bank's slogan "We Do More" reflects the bank's dedication to the growth and success of both the customers and the communities it serves. International Bancshares was ranked 19th on Forbes' prestigious list of 100 Best Banks in America in 2018. MEMBER FDIC / INTERNATIONAL BANCSHARES CORPORATION. Visit us on our YouTube channel, IBCBankWeDoMore. More information is available at ibc.com.